Print developing drums provide a convenient means of processing colour and B&W prints in daylight, using a minimum of chemical solutions. Once the print has been loaded in the drum and the cap is in place, all processing steps can be carried out with the lights on. Chemical solutions are added and emptied from the drum through a light-tight spout. 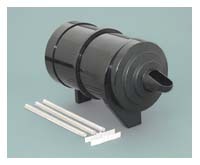 The drum can be manually agitated by hand, or using an optional motorized agitator. The Simma 11x14 drum can accommodate one 11"x14", two 8"x10", four 5"x7", or six 4"x5" prints. Supplied with three paper guides, two print separators, instruction sheet, and centering ring for use with the Simma-Roller motor base. The drum has outside dimensions of approximately 16½"L x 8"W x 9½"H.
These processing drums are used and have minor cosmetic marks from previous use, but are certified to be in perfect working condition.